Every coach in the country would have said that it was the wrong thing to do in that situation. It was too risky, too exposing. With everything on the line, a simple error would mean that it was all over. As Benjamin Ungar lunged forward, he felt the point of his weapon on Denis Tolkachev’s foot. Even before the light came on to indicate the touch, the Harvard epee fencer knew. And then he turned around and yelled—yelled as loud as he could for as long as he could. He had done it. He had won the NCAA individual men’s gold. The foot touch, coming at 14-14 in the individual men’s epee final at the NCAA tournament, was a gamble. But it paid off for Ungar as he became just the third Harvard man to capture NCAA gold. The sophomore’s gold medal helped catapult the Crimson to its first-ever NCAA national championship. Though Ungar’s victory did not clinch the title for Harvard—the sabre bouts were just beginning at the time—it gave the Crimson a significant boost in the race that allowed Harvard to hold off perennial champion Penn State on an intense final day of competition. So just hours removed from his personal achievement, Ungar had the pleasure of celebrating with his teammates, a pleasure that he asserts was much more meaningful than his own gold medal. Nevertheless, Ungar’s run to the gold medal in 2006 showed his growth as a fencer. Though the All-American has been fencing nationally since the age of 10, this past season was the first time he established himself as one of the preeminent collegiate fencers in the nation. Ungar saw limited action his freshman year as he recovered from surgery on his knee. Though he fared well against Ivy competition, he was far from dominant. Coming into his sophomore year, Ungar was hungry for more. He knew he had the potential to win NCAA gold, and he set his sights on the medal. Ungar fenced well against league competition, but he had days when he was beatable. Still, he established himself as a premier epee fencer, earning All-Ivy second team honors. As postseason play approached, Ungar stepped it up to another level. 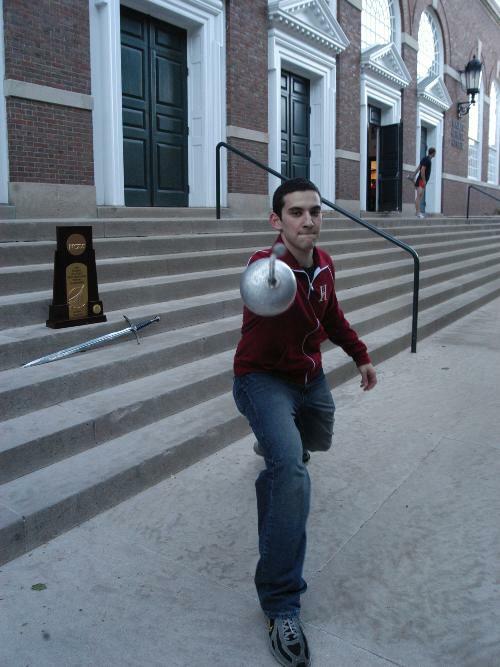 He won a bronze medal at the Intercollegiate Fencing Association championships, helping Harvard win the title. Less than 10 days later, Ungar won the NCAA Northeast Regional, clinching a berth in the national tournament. Though Ungar got off to a slow start at the NCAA tournament, going an initial 3-4 in the round robin, he won 15 of the next 16 bouts to finish in the top four and earn a semifinal berth. He thoroughly outplayed Stanford’s Martin Lee in the first semifinal, cruising to a 15-4 victory and setting up the title bout against Ohio State’s Tolkachev. Tolkachev controlled most of the bout, with Ungar trailing. The Buckeye moved to within one point of the title when he took a 14-13 lead. But Ungar recovered to even the score at 14. And then came the famous foot touch, sending the sophomore into a frenzy of celebration. Ungar capped his season with a bronze medal at the Junior World Championships in South Korea. According to the sophomore, epee fencers don’t peak until their mid- to late-twenties, giving him plenty of time to grow. Brand believes that Ungar has the opportunity to make the Olympic team—if not in 2008, then definitely in 2012. Though Ungar is hesitant to commit to anything just yet, one thing is for sure: he’ll be a threat to repeat as the NCAA epee gold medalist in 2007. After all, if all else fails, he’s always got the foot touch. —Staff writer Karan Lodha can be reached at klodha@fas.harvard.edu.